If there is any book in our library that can pay for itself in short order, this is definitely the one. You can't hire a competent boatbuilder or repairer for a single hour for the cover price of this book...and how many wooden boat repairs can be handled in an hour? Very few. At the very least, the information contained in Repairs will make you a better informed consumer. Nearly all readers have found, however, that once they understand how a repair is accomplished, actually doing it isn't all that difficult. Perhaps that's why we have received so many thank you emails. Just a glance at the cover hints at what's inside. At the top left is a transom being replaced. 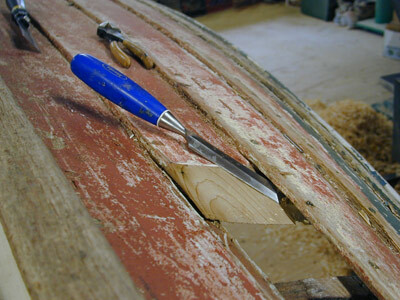 In the middle is a storm damaged boat, with three new lapstrake planks–one of them the garboard! 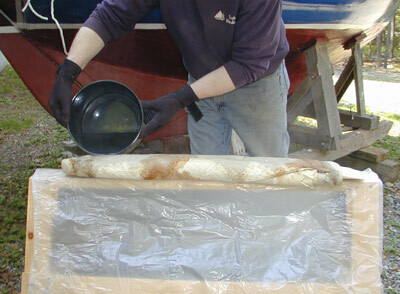 The bottom photo shows the process of spiling a new plank for a lapstrake canoe. These repairs and a good deal more are thoroughly covered. Here's where you can benefit from Walter Simmons' 30+ years of experience. You won't need a shop full of specialized tools, and you won't need years of experience, simply follow the practical advice you will find inside. Repairs is illustrated with line drawings, not photos. One of the operations explained is how to cut a scarph joint in place, as seen below. Below is the easiest way to steam a plank...you will need a heavy cotton cloth, plastic wrap, and a gallon of boiling water. Pour on as much water as the cloth will take, wrap it up tight, and 45 minutes later it will be nice and supple. Pretty complicated stuff, huh? This is the sort of down to earth advice you'll find in Repairs. Repairs is logically arranged according to subject and is extensively indexed to be even more useful. Whether you're interested in basic maintenance or faced with the more challenging task of replacing a stem, a plank, or building a centerboard case, here is a book with the answers you need. Not to downplay the amount of work involved, anyone who has spent much time working around boats is fully aware that repair work is often far more demanding than new construction. That is because, assuming it is done correctly, a repair should be invisible–and to be invisible the original work has to be matched precisely. To achieve that requires an overall understanding of boatbuilding practices as well as an understanding of the materials used and the finishes applied. That covers a lot of territory, but with this book close at hand, that information is within reach. Much of what is included between these covers has never appeared in print, and it surely has never before been gathered together in a single book. BTW, we do offer this title together with Finishing in CD format for less than the cost of the two books combined.